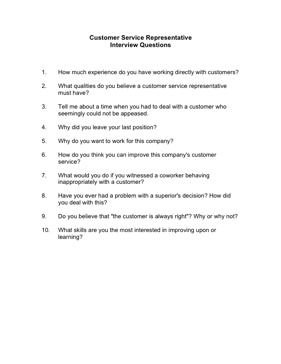 Choose your next Customer Service Representative with the aid of these helpful interview questions. 1. How much experience do you have working directly with customers? 2. What qualities do you believe a customer service representative must have? 3. Tell me about a time when you had to deal with a customer who seemingly could not be appeased. 6. How do you think you can improve this company's customer service? 7. What would you do if you witnessed a coworker behaving inappropriately with a customer? 8. Have you ever had a problem with a superior's decision? How did you deal with this? 9. Do you believe that "the customer is always right"? Why or why not?